The US national parks are just wild at the moment. If you want to see what a Hobbesian Leviathan-style dystopia would look like, one where rule of law is supplanted by total anarchy, Yosemite National Park 2019 offers a little taster. Warning: it involves trash, vandalism, and lots of human poop. In response to the government shutdown, hundreds of thousands of federal employees – including national park staff – have been forced to take a temporary leave of absence, and they will not be able to return to work until Congress and the White House are able to come to some kind of agreement on the subject of Trump’s controversial border wall. According to the Washington Post, Park Service estimates as many as 16,000 of its 19,000 staff base has been furloughed since December 22, 2018. Since the parks, which are usually closed during a government shutdown, have remained open this time, many are having to cope with only skeleton crews at the helm – and no one knows how long this situation will last. Joshua Tree National Park has already been forced to close its doors to the public once, on January 2, when “overflowing toilets” were deemed a health and safety concern. It then threatened to enforce a more open-ended closure, essentially, because people (not all people, it stressed, but some people) were being dicks. Not only are people driving off-route, creating new roads into previously undisturbed protected land, but it seems that there are a group of individuals who are using the government shutdown as an opportunity to vandalize public property, including the park’s famous Joshua trees ( Yucca brevifolia). 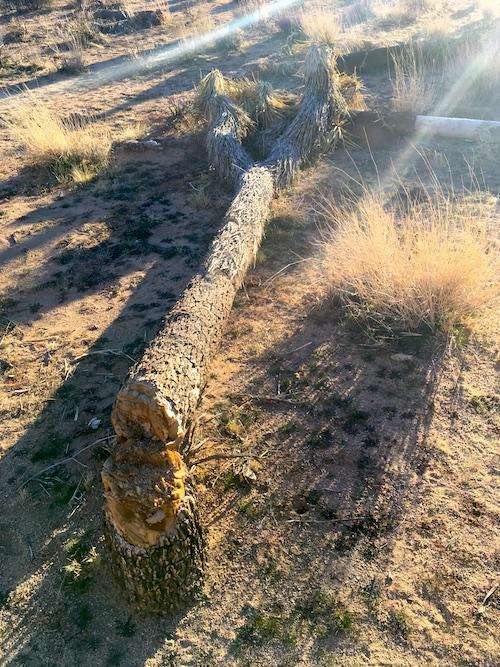 A Joshua tree in Joshua Tree National Park, cut down by vandals with no apparent motive. Joshua trees are late bloomers, taking 60 years to mature. They can live for more than 500 years, making this act of vandalism particularly devastating. Taken by NPS. Fortunately for nature enthusiasts, officials have decided not to close the park, which had been scheduled for January 10. Instead, they will use revenue generated from ticket sales to bring back maintenance crews. As well as preventing closure and putting more people out of work, this means they will also be able to reopen some areas of the park that had been sealed off to the public following the government shutdown. “National Park Service officials have determined that by using Federal Land and Recreation Enhancement funds to immediately bring back park maintenance crews to address sanitation issues, the park will be able to maintain some visitor services, including reopening the campgrounds,” read a statement, updated on January 9. Until now the 800,000-acre park has been managed by just eight rangers and a handful of volunteers, which is clearly not enough to prevent (some) people from descending into Lord of the Flies-like madness. Hopefully, this little extra help will tide things over until normalcy can be restored and this whole border wall farce is put to bed.